Barbeque buffets are very popular here and in fact all over Thailand. You can choose you're own raw ingredients from large buffets and cook or grill them right at your table at a charcoal fire in big stone pots, see the last photo. Best thing: Eat all you want, without any time limit, for a very afforable price, which may vary from 99 Baht (EUR 2,30/USD 3.-) to 160 Baht (EUR 3,75/USD 5.-) per person. Most buffet restaurants will offer live music till midnight and some of them are open from 6pm till 6am, the next day. 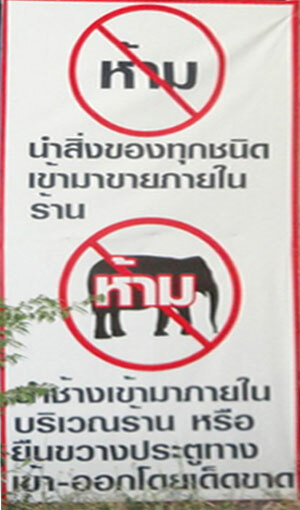 The top sign in front of the restaurant says: 'No parking and no street sellers allowed' and the bottom one says: 'Forbidden for elephants'. On the third photo you can see the main entrance is quite small and I really had to squeeze my way in between the scooters or motor bikes, so no way any elephant could possibly get in there, so I assumed it was meant figurative, for example to prevent big and hungry people from eating too much. And Isan people do eat a lot and somehow manage never to get fat, it must be something in the genes I guess. Instead it seemed, that 'beggars' occasionally visited the place annoying guests to receive money to feed their elephant, keeping the elephant at the street-side, so I was told. Well when I was there tonight, no elephant or a street seller in sight, but enough illegal parking, as you can see on the other pictures.